History is loaded with injustice of kings who built their mansions on bodies of deprived, poor people. Seemingly the glory and majesty of their kingdom depends on their mansions; purity of their thought and action is revealed in the breadth, beauty and number of their mansions. Their large ,small, red, green, white, summer, winter, country mansions, were all nothing but a tall wall that distanced them from mass’s poverty, hunger and pain and covered their debauchery and sensualism. The common aspect of all kings including Pharos of Egypt, Roman Emperors and Islamic Califats was their luxurious lives in their palaces. They treated masses as their slaves who had to work, to even die so that their masters could live a comfortable life in their luxurious mansions. Whom I’d like to write about here is not among those kings, emperors or Pharos but a power-crazy and delusional personality who has madly imitated those kingdoms and has built a lot of mansions for himself by victimizing and deceiving thousands of innocent individuals who act as his slaves. I write the article to record what I witnessed in the history and to awake those who may still believe in the MKO leaders’ so-called honesty, sacrifice, revolutionary, anti-discrimination and anti-exploitation ideas. They should know that their believe is just an illusion because a revolutionary leader who claims honesty and devotion should live a life like his public; he should be honest to his followers and supporters, but, it’s a pity that no honesty, no devotion and no sincerity is found in Massoud Rajavi’s personal life. Rajavi’s appearance may not seem like Pharos, Emperors and kings but his interior life is the same as them. He has servants, maids, workers and a queen. He has torturers, prisons and turnkeys. He doesn’t admit any opposite idea and eventually threatens or kills his opponents or systematically destroy their character. He lives in expensive luxurious mansions. He thinks that it is his right to live a comfortable life but his forces should live in difficult situation to maintain their revolutionary spirit!! Appreciating my friends' cooperation, I note that this series of articles on “Rajavi’s Mansions” was authored by the help of a number of my friends who are also former members of the MKO. 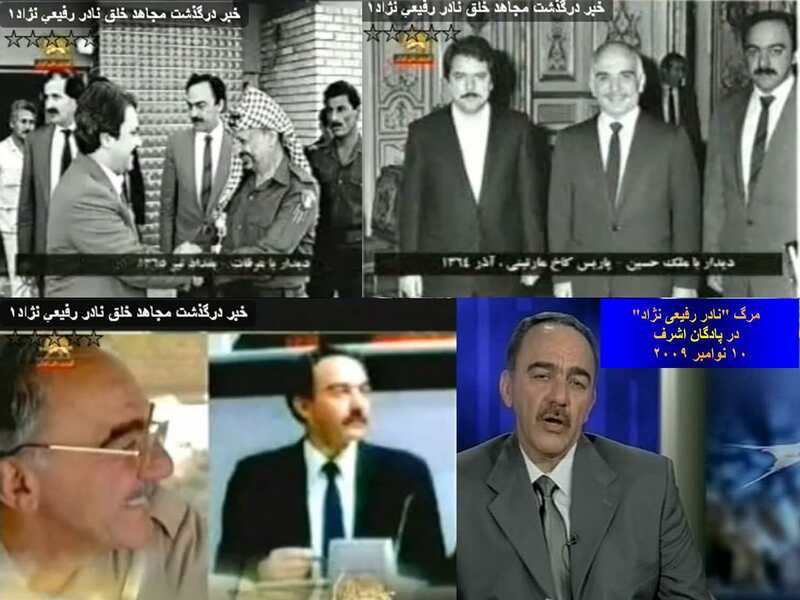 While the MKO’s propaganda was all the time speaking of the group’s bad financial situation and the group’s urgent need for funds, Massoud Rajavi was spending millions of dollars to build mansions, houses and safe havens for himself and Maryam Rajavi all over Iraqi territory. This base was located near Baghdad and was founded in 1996 and named Hanif Base. It was essentially one of the five military bases established in 1996 and 1997. Since 1997, the base was turned in to the main political and propaganda headquarters. In western side of Badi Zadegan base, about one fourth of the base’s breadth was allocated to Rajavi’s private mansion. The place was built so strongly and decorated so lavishly. During following years more rooms and halls were added to the main building. The green space included a pool and very beautiful trees. The mansion was departed from other parts of the base with very tall walls. The base included some trenches and ramparts in Kefri hills which apprently looked like a village and used by the Rajavis during Kuwait War. When the coalition forces attacked Kuwait, the trenches were camouflaged like a village. It was soon equipped for the Rajavis. Rajavi spent most of that 40-day long war and bombardment in the place while other forces guarding the base had no trenches and had to stay in tents or shelters. After the war ended, the base was destroyed by the group because they didn’t want the Kurds to reach it. Forough 1 was a villa that was given to the Rajavis by Iraqi Intelligence service to protect them from coalition forces’ bombardment. As the coalition troops didn’t target religious cities like Karbala, the rajavis moved to the base where an Iraqi Intelligence official always accompanied them. Following the Iraqi shiits uprisings in Southern cities, the Rajavis were forced to flee the base. Some of Rajavis’ guards stayed at the base, they were then killed by people. It was later said that those guards had gone there on mission because they didn’t want anyone to know about Rajavi’s covert base in Karbala. There was a large base near Baquba not far from Iranian border. It was turned in to a green zone with elegant buildings that a 5-member team was always guarding. I went to the base a few times but I could never know about its exact name and address. The base was never used publically and just a few members of Rajavi’s guards had information about it. As the result of Rajavi’s hard work to gain one of saddam’s palaces, this palace in Tikrit was given to him. Large amounts were spent to make it more luxurious but the base was never used by the Rajavis because of the threatened geographical situation. It only satisfied his greed. It was a two-story villa in Samira, called “Agha”. It was used for Rajavi’s pilgrimage time at this religious city. Although it was highly luxuriously equipped, it was not used more than two times. The base was originally an anti-bomb trench and the headquarters of Saddam’s Northern front. It had a lot of rooms, a conference hall and an eating place. It was completely reconstructed and furnished but it was destroyed following the American occupation of Iraq. The base had been granted to Rajavi as a gift for the services he offered Saddam Hussein during Iraq-Iran war. 1. Ramsar recreational centre in Habania Region: there were a few luxurious villas by the side of Habania Lake. It was considered as one of Rajavi’s clandestine bases. A very few members knew about the place. Maryam and Massoud Rajavi used to go there for vacation sometimes. They didn’t take there all of their security guards. They used to go there by the company of a very small number of the most reliable cadres. 2. Safe base in Al-Musbah region: it was a two –story building, completely furnished, neighboring two safe houses of Iraqi Intelligence service. The base was granted to the group for Rajavi’s meetings with Iraqi Intelligence officials. Sometimes, Rajavi had a short stay in the base before the meeting with Iraqi authorities and then an Iraqi agent escorted him to the meeting. 3. Babaiee base in Abu Nowas region: it was a building in a beautiful region opening to Dijla river. This was also gifted to the MKO by Iraqi Intelligence, used for visits between Rajavi and Intelligence authorities or for short-term stays. 4. Anzali Base in Aras Hinda region: the complex was again granted to Massoud Rajavi by Iraqi Intelligence. It was by the side of safe houses of Iraqi Mukhaberat (intelligence service) and used for visits with Intelligence officials. a. Base Seifi: the base was Rajavi’s home in Baghdad in 1986. The first meetings with Iraqi authorities took place in that building. The houses neighboring Seifi base were evacuated and the street were blocked at both ends. Iraqi Security guards and MKO guards were protecting the base all the time. The basement was consolidated as a trench. There was a gorgeous building on Second Street of Andolos base. It was reconstructed like a palace-which was used for Rajavi’s meetings and receptions. c. Building B: Ultimately Rajavi’s main base was a large 4-story building called “Building B” in an alley on second street. It was exactly located behind another building called ‘'Building A”. It contained 5 story and 100 rooms. It was kept empty all the time in order to protect Rajavi. 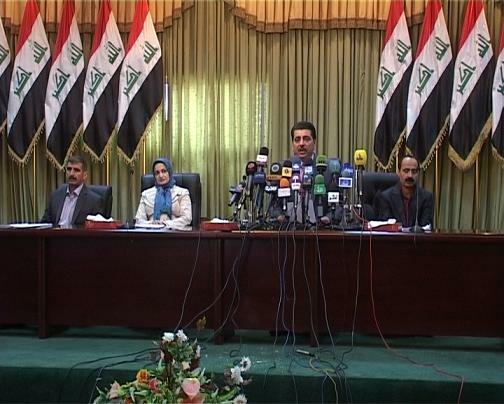 It was only used a few months of the year for a limited number of authorities and forces who came to Iraq from abroad. Note on Hotel Nofotil, Baghdad: Hotel Nofotil was located in front of Andolos complex which was like a huge castle. The hotel opened to the street where Rajavi’s house was located so it was considered a security problem so the organization rented two floors of the hotel at a very high fee. It was always empty to guarantee Rajavi’s security although Rajavi used to stay in Baghdad only three or four months of the year. When I was a member of security unit in Baghdad, besides a large number of Iraqi forces about a hundred people used to protect Rajavi’s bases day and night. 1. Temporary houses next to Ashraf conference hall: exactly by the side of Ashraf conference hall, there were two temporary houses allocated to Rajavi. The first house had several rooms for reception and accommodation which was situated on the Southern side of the hall. The other house was on the South-Western side. It had a yard with planted parterre, bedrooms, living rooms and bathrooms. The house was built after some changes were made in the conference hall and Rajavi’s tribune was moved to another part. The houses were used only when Massoud Rajavi held public meetings in the hall. He was received there while he was taking a break between meetings. 2. Permanent base in commanding headquarters: this was a luxurious, large palace between St.400 and St.600. It had various buildings and large basements (shelters).it was never said to the MKO forces that the place was Massoud’s house but gradually members told each other. The following picture shows protecting area around the palace. The blue arrow shows the underground shelter and the green arrow shows the small hall of the headquarters. On the north-Western part of the complex, there was a private shooting hall that was for Massoud Rajavi’s shooting practice. 3. Anti-bomb shelter and palace on St.100: on the Western side of water filtration plant of Camp Ashraf, on the corner of St.100 and St.400,a well-equipped ,luxurious and anti-bomb house was completely secretly built by Iraqi engineers and contractors. Members of the group were totally unaware of the existence of such a shelter. They were told that an underground water storage was established there! The new base was built at millions of dollars cost and was named “Simorgh”. It contained a large green area around a central building with dozens of rooms and halls with a complicated plan. It took near three years to build the whole complex. The base was furnished with the most expensive and the most luxurious furniture that was purchased in Europe and brought to Iraq. It was said that the base was copied of a Saddam Hussein’s anti-nuclear bombs palace, for emergencies. Massoud Rajavi lived in this base during his long-term clandestine life after 2003. The MEK cemetery was previously inaccessible as it lay inside the former boundaries of Camp Ashraf. Following the Iraqi military operation to reclaim illegally held land from the MEK in April 2011, the cemetery is now open to view and to independent investigation. Families and former MEK members arriving at the cemetery led by Mr Hassan Azizi a veteran former member. He spent years struggling to get himself and his children out. Still later his wife also managed to escape. The family now live in the Netherlands. 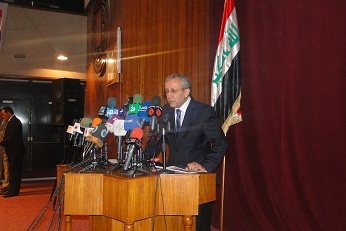 Mr. Azizi was part of the European delegation recently visiting Iraq and the Camp. This is a memorial to the MEK who died in the MEK’s Operation Pearl in Iraqi Kurdistan in which Rajavi took orders from Saddam to massacre Kurdish villagers. Maryam Rajavi famously ordered her forces to run over the victims with their tanks so as not to waste bullets unnecessarily. The MEK, acting as Saddam’s Private Army, were used to viciously quell the Kurdish uprisings in the north. In the south in 1991 the MEK were also used to suppress Shiite uprisings. This picture is a memorial to three of the top MEK commanders killed by the people of Karbala during the Shiite uprising when they took over Saddam’s Secret services HQ in the province. The bodies were never recovered. The three central graves are flanked by the graves of Neda Hassani and Sediqeh Mojaveri who died as a result of self-immolation ordered by Maryam Rajavi to protest her arrest by French anti-terrorism police at Auvers-sur-Oise in 2003. Before the Iraqis gained control of the cemetery Rajavi had ordered that the pictures of the graves in the whole graveyard be mixed up so they do not correspond to the names on the graves. Perhaps only Rajavi can explain his motive for such a bizarre act. The Iraqis have reported however that some of the graves have been found to contain more bodies than the single named person indicated on the headstones. Ex members identified many graves of people who have been killed in the hands of the leaders of the organisation. 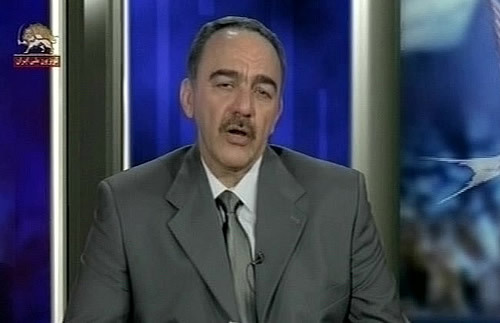 Nader Rafi'ee Nejad acted as a torturer for the Mojahedin-e Khalq leader Massoud Rajavi. He was a veteran member of the MEK who, along with Reza Khaksar (later killed during an armed clash in 1981) and Hassan Mohassel (a former police officer and later a guard in the MEK’s prisons in Iraq), served with the Revolutionary Court in Evin prison after the Iranian revolution. Rafi’ee Nejad interrogated and tortured former officials of the ousted regime of Shah. Due to the MEK's pursuit of its own radical policies after 1980, Rafi'ee Nejad, Mohassel and Khaksar were later dismissed from the Revolutionary Court by the government of the Islamic Republic at that time. After the armed struggle began in 1981, Rafi'ee Nejad fled to Europe and was appointed to the MEK’s foreign relations department. In 1985, he was introduced as a leading member and in 1991 as deputy to an executive board in the MEK. In 1990, he shed his ‘diplomatic’ suit and donned the uniform for jailors of the MEK in Iraq. In that year, he attended a course with Iraq's intelligence and security service to undergo classic training by Iraqi interrogators. He was involved in torturing Mohammed Hussein Sobhani and also the killing of Parviz Ahmadi who died under torture. Two of the victims who have been directly tortured by Nader Rafi’ee Nejad are Mohammad Hussein Sobhani and Ali Ghashghavi. In the picture above, they are standing beside the grave of their former torturer. Both men were sent to Abu Ghraib political prison by Massoud Rajavi after extensive imprisonment, isolation and torture inside the MEK’s own prisons failed to force them to submit to Rajavi. Rafi’ee Nejad frequently visited them even when they were in Abu Ghraib. 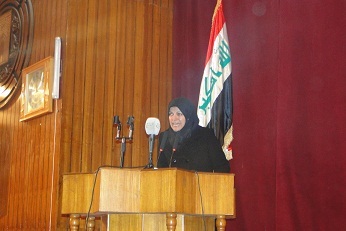 They were released during the fall of Saddam in 2003. There were over 50 registered ex-MEK prisoners in Abu Ghraib at that time labelled as a group as ”Mojahedin Deposits”. 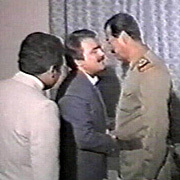 Remembering the brutality of Rajavi’s torturers and prisons, both victims of Rajavi and Saddam prayed for forgiveness for their torturer.